This is a beautiful cemetery on Rowell Hill Road, off Route 12 in the Dog River Valley. 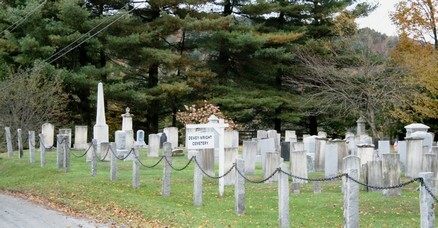 The cemetery is fenced with granite posts. The front fence line and the east side has black chain installed. The other two sides have wood fencing between the granite posts. There is a gate into the cemetery from the road and a simple roadway runs through to the back side dividing the cemetery into two sections.